In selling President Trump’s tax plan, his aides have resorted to making strikingly misleading statements to defend it. 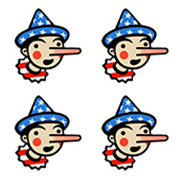 In the meantime, we have a pair of Four-Pinocchio claims that are worth highlighting. The Trump tax plan drops the top bracket from 39.6 to 35 percent, and allows for the possibility of a 25 percent top rate through a pass-through entity. It presumably would also eliminate a 3.8 percent Obamacare tax on investment income that hits only upper-income taxpayers. So, on its face, this is a ridiculous statement to make for any plan that includes reductions in tax rates. That’s because federal income taxes are paid mostly by the wealthy. So when you cut income tax rates, it results in lots of dollars for the wealthiest taxpayers. According to Treasury Department data, the top 10 percent of income earners in 2016 paid 80 percent of individual income taxes. The top 20 percent paid 94.8 percent. The top 0.1 percent paid an astonishing 24.5 percent of taxes. In 2014, the latest year Internal Revenue Service data is available, just the top 400 taxpayers — with $127 billion of income — paid $29.4 billion in income taxes, or more than 2 percent of all income taxes. That’s more than the bottom 70 percent of taxpayers combined. In other words, the vast majority of American taxpayers pay little or nothing in income taxes; they instead mostly pay payroll taxes such as Social Security and Medicare. So it really strains credulity for administration officials such as Cohn to say the wealthy will not get a tax cut. The wealthy pay most of the taxes, so unless the tax plan specifically leaves them untouched — which Trump’s plan does not — they will get big tax cuts. This is why distributional tables often look so lopsided when tax rates are reduced. The administration has suggested that another, higher rate level might be added, presumably so the distributional tables won’t look so ugly, but right now the plan calls for a significant reduction in the top rate. Besides a reduction in the top tax rate, the tax plan would eliminate the alternative minimum tax (AMT). That in theory should be a boon for the wealthy as well, although it increasingly has snared families in the upper middle class, especially if they live in high-tax states or have many children. So it’s possible that for many people it would be a wash, or even a net loser, depending on whether a tax filer lives in a state with high taxes. According to JCT, the AMT is paid by 36 percent of returns with income of between $200,000 and $500,000, nearly 55 percent between $500,000 and $1 million, and nearly 18 percent above $1 million. Still, in 2014, the top 400 taxpayers paid nearly $700 million because of the alternative minimum tax, nearly 2.5 percent of the total. The one recent tax return of President Trump that has leaked — for 2005 — shows his tax bill increased $31 million because of the AMT. Finally, the tax plan calls for eliminating the estate tax, although it is unclear on whether any tax would be required when someone dies. Currently, the estate tax is estimated to affect only about 5,500 estates out of nearly 3 million estates because as much as $11 million can be shielded from taxation. In theory, assets would be subject to capital gains tax instead, which could actually affect more people, but that has not been specified in the administration’s tax outline. If the administration also eliminates the gift tax and does not tax capital gains at death, some income earned by the wealthy may never be taxed. “We strongly believe the final tax bill will not cut taxes for the wealthy as a class — but there is no way to solve for every single individual in the country,” a White House official said. Mnuchin made this statement in response to an observation that the nonpartisan Committee for a Responsible Federal Budget has estimated the tax plan would reduce revenue by $2.2 trillion over 10 years. (Including additional interest on the debt, CRFB estimated the deficit would increase by $2.7 trillion.) He argued that instead there would be an additional $2 trillion in revenue from economic growth, resulting in a $1 trillion reduction in the deficit. It’s a little odd that Mnuchin is anticipating $2 trillion in revenue and Cohn is anticipating $3 trillion in revenue. But these are both very rosy estimates of the impact of a tax cut in economic growth. No serious economist believes that a tax cut boosts economic growth so much that the tax cut pays for itself. Though the details of the tax plan are sparse, both Cohn and Mnuchin made statements that are simply false. Of course the wealthy will do well under the tax cut, even if certain deductions are eliminated, and it’s silly to pretend otherwise. And it’s a fantasy to claim that the tax cut will pay for itself — and even reduce the deficit — especially in an economy that already has low unemployment and a booming stock market. in an interview on ABC’s "Good Morning America"